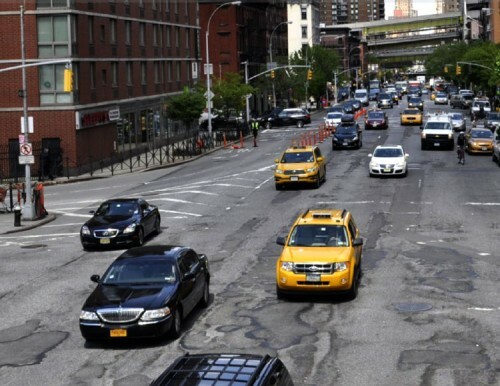 With only 75 weeks left in New York Mayor Michael Bloomberg’s administration, cyclists the city over will inevitably be concerned about the next mayor’s stance on bike lanes and street designs lest initiatives put in place under Bloomberg fall from grace. One need only to recall Marty Markowitz’s parodic tricycle stunts poking fun at bike lanes or former NYC DOT commissioner Iris Weinshall’s efforts to remove a protected bike lane from Brooklyn’s Prospect Park West to realize that the concern is not unfounded. At yesterday’s regularly-scheduled City Planning review session, former Bogotá Parks Commissioner Gil Penalosa was invited to give a pep talk, placing a particular emphasis on bike lanes. He warned an audience filled with commissioners and planning staff that as the weeks wind down before the mayor leaves office, they’d better get cracking at PR and permanence: the public needs to become even more familiar with the bike network and the infrastructure needs to become permanent—and striped bike lanes won’t cut it! Though much of 9th Avenue in Chelsea features bike lanes, the area near the Port Authority Bus Terminal remains a bit chaotic. Penalosa now runs the Toronto-based non-profit 8-80 Cities, which espouses the philosophy that if a city is safe for 8-year-olds and 80-year-olds then it will be safe for all citizens. While the philosophy is applied to sidewalks as much as bike lanes, it is particularly interesting when applied to the great strides made in New York’s bike network under current DOT Commissioner Janette Sadik-Khan. Take 8th or 9th avenues in recent years as an example. You might not be too concerned if your kid or grandma pedaled along the green-painted, protected bike lanes in Chelsea, where the lanes runs between the sidewalk and a planted median, and is further buffered from car traffic by parked cars. But moving toward Midtown, the street shifts and bike are moved into narrower striped bike lanes or sharrowed streets at the Port Authority Bus Terminal with no separated bike lane at all. 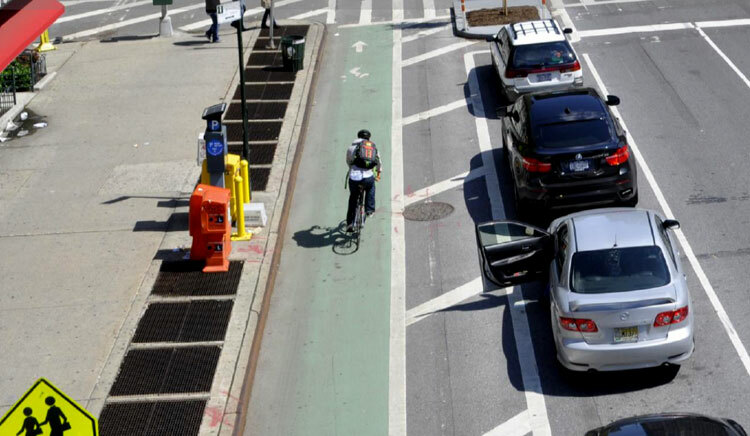 Fortunately in this case, the city recently announced that 8th and 9th avenues will be treated with protected bike lanes between 34th Street and Columbus Circle, filling in the missing teeth. Clearly some of Sadik-Khan’s surgical approaches to curb traffic, increase safety, and make way for pedestrians and cyclists are working their way toward permanence, with Snøhetta’s Times Square redesign being most extraordinary example. But Penalosa warned that an incremental approach to building a bike network is like the city building a soccer field in phases: We’ll put up one field goal this year, then part of the field next year, and hopefully we’ll get to the other goal before the next administration decides its a waste of money and abandons the plan. And with the city’s 10,000-bike-strong Citi Bike bike-share system to be launched as soon as August, a complete bike network will be more important than ever. Penalosa said that the bike network as it stands is a very substantial start that has opened people’s eyes. Cities the world over are pointing to New York’s plan as an example, and some, like Chicago, are taking it even further. But he noted that without a network of protected bike lanes and lower traffic speeds, bike infrastructure will struggle to reach its full capacity beyond those who are already established cyclists. If the city wants to coax more people into the system, Penalosa said, then they need to feel safe.